Watanabe, S., B. Rost., M. Camacho, M. W. Davis, B. Söhl-Kielczynski, A. Felies, C. Rosenmund and E.M.Jorgensen. Ultrafast endocytosis at mouse hippocampal synapses. Nature 504, p242-247. Watanabe, S., Q. Liu, M.W. Davis , N. Thomas, J. Richards, G. Hollopeter, M. Gu, N.B. Jorgensen and E.M. Jorgensen. 2013. 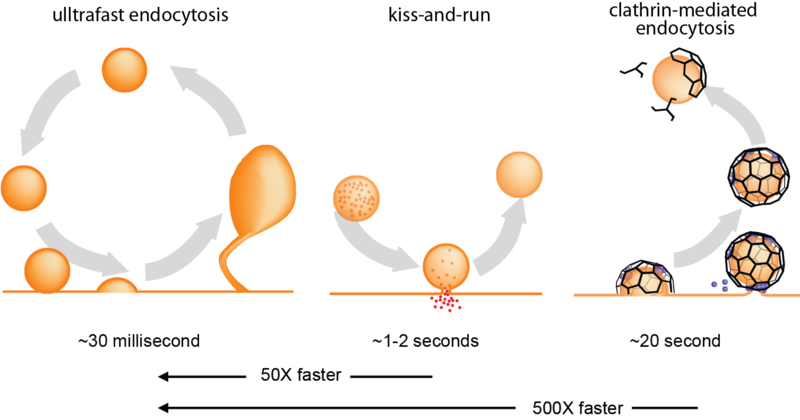 Ultrafast endocytosis at the C. elegans neuromuscular junction. eLife 2:e00723. Ritter, B., S. Murphy, M.V. Gudheti, M. Halin, J. Philie, E.M. Jorgensen, K. Gehring, and P.S. McPherson. 2013. NECAP 1 regulates AP-2 interactions to control vesicle size, number and cargo during clathrin-mediated endocytosis. PLoS Biology 11, e1001670. Gu, M., Q. Liu, S. Watanabe, L. Sun, B. Grant, and E.M. Jorgensen. 2013. AP2 hemicomplexes contribute independently to synaptic vesicle endocytosis. eLife 2, p00190. Mullen, G.P., K.M. Grundahl, M. Gu, S. Watanabe, R.J. Hobson, J.A. Crowell, J.R. McManus, E.A. Mathews, E.M. Jorgensen, and J.B. Rand. 2012. UNC-41/Stonin functions with AP2 to recycle synaptic vesicles in Caenorhabditis elegans. PLoS ONE 7:e40095. Sato K., Ernstrom G.G., Watanabe S., Weimer R.M., Chen C.H., Sato M., Siddiqui A., Jorgensen E.M., Grant B.D. 2009. Differential requirements for clathrin in receptor-mediated endocytosis and maintenance of synaptic vesicle pools. Proc Natl Acad Sci USA 106:1139-1144..
Bednarek, E., L. Schaheen, J. Gaubatz, E.M. Jorgensen and H. Fares. 2007. The plasma membrane calcium-ATPase is required for clathrin-mediated endocytosis. Traffic 8, p543-553.